Welcome to my lighthouse blog. Lighthouses are an intriguing part of history. 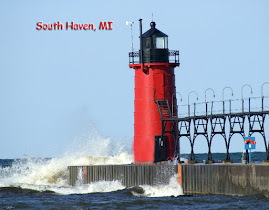 I hope you will enjoy my comments and photographs on visiting lighthouses. On our visit to the Mackinac Island area of Michigan we took a drive out of Mackinaw City to search for more lighthouses. We discovered the above lighthouse, Forty Mile Point lighthouse, along the shores of Lake Huron. 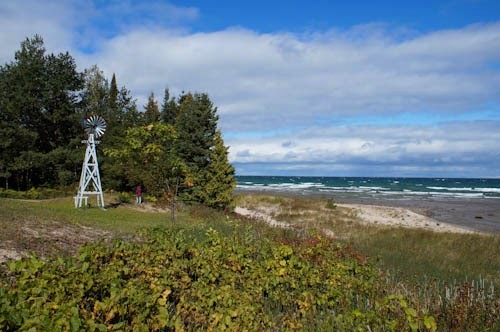 It is located approximately forty miles southeast of Mackinaw City. In 1890 the lighthouse board requested this lighthouse to be built to fill in the gap between the lighthouses in Cheboygan and Presque Isle. There was 50 miles between them and that left a dark spot for ships to loose their way along the shorelines. The lighthouse at Forty Mile Point was completed in 1896. We found the lighthouse to be very similar to the one at Big Bay Point, a lighthouse we had visited and stayed in on a previous visit to Michigan. In researching the lighthouses I found they were both built in the same time period. 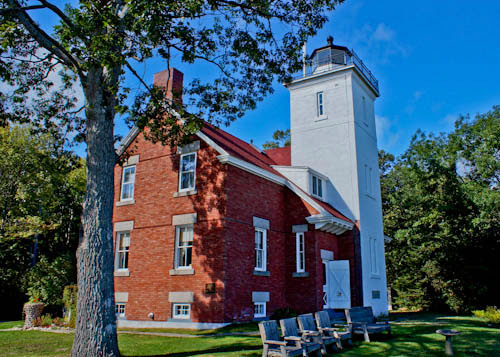 The lighthouse at Forty Mile Point is now part of a park that is open to the public. I was able to walk around the grounds and climb the tower to the lighthouse. There were several interesting out buildings along with a small gift shop. Here is a view of the shoreline from just below the lighthouse.